Not to be confused with something you made in your Easy Bake oven, these veggie are both easy and baked... and delicious. One afternoon this summer, Jude and I stopped by my sister's house and she had veggies in the oven. 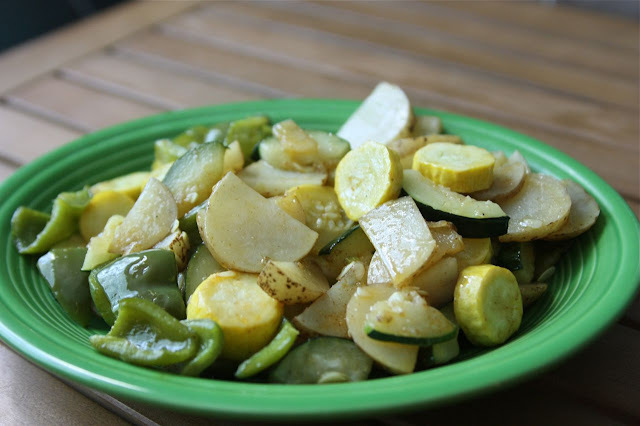 If you're like most of our rural friends, either you or someone you know gardens, which means that you probably have squash and zucchini coming out of your ears right now. This is an easy and delicious way to fix them. It works great as a side dish (we ate this batch with grilled pork chops), or on its own as an afternoon snack, which is how we had them at her house. Slice and chop up as much of each veggie as you want. Drizzle some oil, melted butter, or ghee on a large cookie sheet. Toss all of your veggies onto the cookie sheet and drizzle again with oil, butter, or ghee. Sprinkle GENEROUSLY with seasoned salt. The more, the better. Bake for 30-45 minutes, turning and stirring occasionally, until veggies are tender.